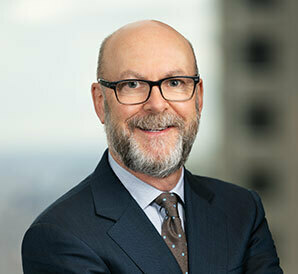 In his civil litigation and white collar defense practices, Ed litigates and tries cases, and argues appeals in both federal and state courts. He also counsels and conducts investigations for clients facing potential civil and criminal litigation, and represents clients in grand jury proceedings. Ed also is General Counsel of the Firm. Ed represents clients in commercial disputes in several industries, including the financial services, real estate, automotive, luxury goods, and health care industries. He commonly represents clients in these industries in contract disputes and tort claims, and he also has considerable experience litigating over non-compete agreements. Ed defends clients in litigation related to his white collar defense practice, including antitrust, securities and consumer fraud, class action litigation, product liability, and litigation arising under the False Claims Act. Ed spends about half his time counseling and defending individuals and corporations in connection with criminal investigations and civil enforcement actions. Recently, these have included investigations by the Department of Justice, the SEC, the OCC and SIGTARP. His experience includes representing clients in investigations of securities and other financial fraud, insurance fraud and criminal antitrust violations. Ed has represented engineering firms, health care companies, and defense firms in grand jury investigations into alleged fraud in their business dealings with the federal government and other public entities. Ed regularly conducts internal investigations for clients and counsels them on compliance with federal criminal law and in connection with disclosures of potential violations. Represented multinational food conglomerate in class action civil litigation and grand jury investigation into alleged price fixing of high fructose corn syrup and citric acid. Represented financial institution in litigation regarding alleged fraud in the sale of assets of failed bank. Represented investment firm in litigation over failed merger agreement. Represented broker dealer in arbitration over alleged fraud in sale of assets. Represented law firm in securities fraud litigation over failed savings and loan. Represented financial institution in breach of contract litigation over priority in commercial real estate foreclosure. Represented employers and employees in non-compete litigation in various industries, including luxury goods and high speed trading. Represented international beverage company in arbitration arising from acquisition of vodka distributor. Represented on-line reservations provider in arbitration alleging breach of contract by airline partner. Represented real estate developer in various partnership disputes. Represented financial institution in SEC financial accounting fraud investigation and related OCC and grand jury investigations. Represented several financial institutions in SIGTARP investigations. Represented financial institution in receivership proceedings arising from grand jury investigation into money laundering. Conducted internal investigation into allegations of accounting fraud at credit union. Represented defense and health care companies in civil and criminal investigations into accounting fraud in connection with government contracts, as well as related qui tam litigation. Conducted internal investigation for Audit Committee of international energy company into failure of management to communicate cost overruns in natural gas project. Represented engineering firm in grand jury investigation into bid rigging. Represented insurance broker in bribery investigation. Represented insurance broker in fraud investigation. Ed is co-chair of the Firm’s Pro Bono Committee and devotes significant time to representing clients in various pro bono matters. Some of Ed’s most recent pro bono representations are listed below. Represented Iranian seeking political asylum in the U.S. after being targeted by the Iranian government for participating in the historic protests that followed the election of Iranian President Mahmoud Ahmadinejad in 2009. This appears to be one of the first U.S. asylum cases connected with the widely reported 2009 election protests in Iran. Represented Honduran national seeking withholding from removal from U.S., to which he fled after being tortured by Honduran police for work on deforestation, clean water and other related environmental issues in Honduras. Ed serves as general counsel for the Unity Temple Unitarian Universalist Congregation in Oak Park Illinois. In that capacity, Ed represents the congregation in a variety of matters. Most recently and significantly, Ed represented the congregation in various transactions related to the historic restoration of Frank Lloyd Wright’s Unity Temple, which is regarded by many as the most important piece of modern architecture of the 20th century. Ed serves as President of the Board of Cedille Chicago, NFP, a not-for-profit classical music recording label that records and distributes work by Chicago artists, and Ed represents Cedille in a variety of legal matters. Represented major medical device manufacturer in False Claims Act litigation alleging violations of Buy America Act in sales to government. Represented multinational food conglomerate in class action civil litigation into alleged price fixing of citric acid. Represented multinational food conglomerate in class action civil litigation and grand jury investigation into alleged price fixing of high fructose corn syrup. Represented defendant in class action in the Circuit Court of Cook County, Illinois, alleging violations of the Telephone Consumer Protection Act. "Selected Issues Under the Federal Rules of Evidence,"
"The Future of Deferred-Prosecution Agreements: Congress Tries a Little Oversight,"
"More Problems With 'Honest Services' Fraud: The 7th Circuit Takes Another Whack at Section 1346,"
"Private Citizens and Public Corruption: The Problems With 'Honest Services' Fraud,"
2005 – Thomson West 3rd ed. "Legacy of the Reconstruction: The Vagueness of the Criminal Civil Rights Statutes,"